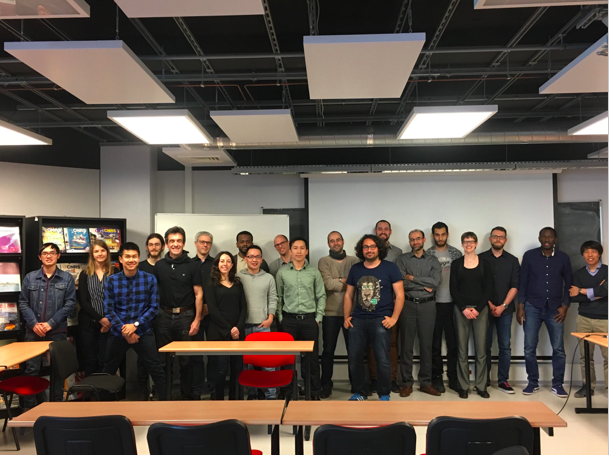 The ONOS Performance and Security Analysis brigade members gathered for the second annual brigade workshop in Paris downtown, LIP6, on April 11, 2018. About 30 among old and new brigade members as well as Sorbonne University and ESME masters and doctoral students attended to discuss recent activities of the brigade. During the meetup different topics were addressed, including: ONOS vs ODL performance analysis, SDN switch teleportation attack, ONOS performance with NETCONF, XMPP as a southbound interface for ONOS, equal-cost multi-path load balancing with ONOS, DELTA in a heterogeneous telco SDN environment, consistency management in SDN, control-plane performance with the eventually consistent flow rule store. The sec&perf brigade is report-driven, but occasionally leads to code contributions. Members have for instance contributed to the development of LISP, XMPP and NETCONF SBIs, as well as stimulated fixes to discovered vulnerabilities and configuration issues. The annual brigade report, to be published in September 2018, will feature updates about some of the analysis previously conducted on ONOS 1.10 and 1.11 for the 1stst brigade report (read it here, ONOS section), hence being re-run for ONOS 1.12 and 1.13. Namely, we will update the QA tests, bundle failures, vulnerabilities and configuration issues analysis. In addition, we will feature new analysis run by ESME on XMPP performance and load-balancing feature assessment, by Orange on path recovery performance, and by Nokia and Airbus on NETCONF SBI stress test and operational feedback. A new topical report on ONOS vs ODL, to be published end of 2018/beginning of 2019, to compare the two most adopted open source controllers under the Linux Foundation umbrella. The comparison will be in terms of a number of items, such as vulnerabilities and security flaws, latency tests, bundle reliability, path recovery and network discovery. Additional test proposals are welcome for both current reports, especially if already ongoing, or for future reports – feel free to contact the brigade lead to discuss them. Please reach out to the brigade mailing list (secperf-brigade@onlab.us) if you have any questions or want to get involved.